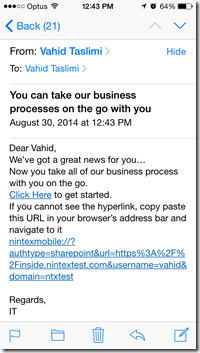 Nintex Mobile has deprecated support of pre-populating sign in information using deep link. On the other hand you now can Launch the app, open a specific form and pre-populate it’s field using a deep link url. 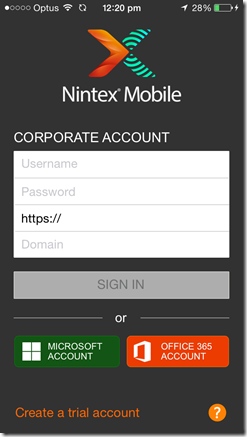 Nintex Mobile is a great way to take your business process with you on the go anywhere; no matter you are online or offline. To use the app you need to download it from the store and sign in to a specific SharePoint URL using your credentials. While remembering all of the information and instructions for an advance user is not an issue, most of users have to refer to the instruction sent by IT in order to sign in and use the app. 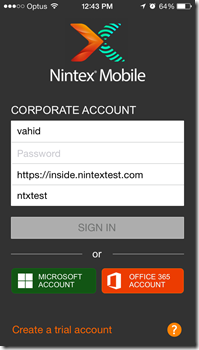 Nintex Mobile 3.0 has got a new feature which lets users launch the app and pre-populate authentication information through a hyperlink. Using this fantastic feature users don’t have to remember their authentication type, SharePoint/tenancy URL or their domain. All they need to do is to click on a link enter their password and sign in. 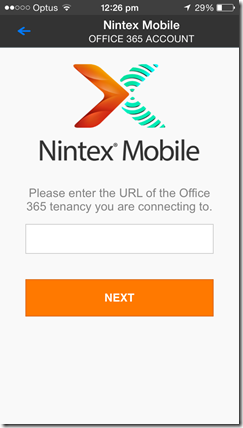 This feature makes deployment of Nintex Mobile in organizations much easier for IT. 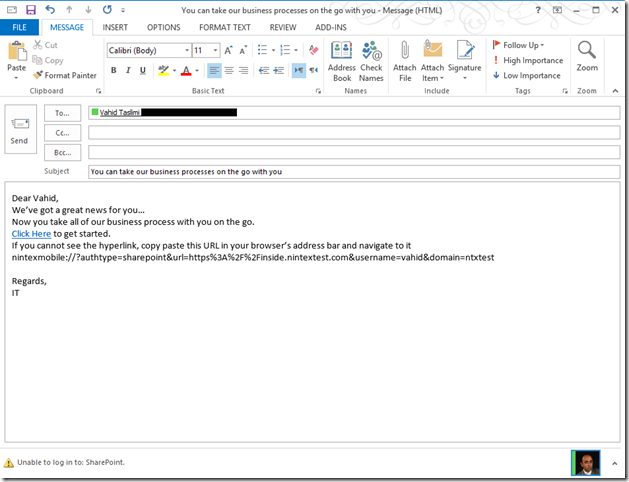 url: A string representing the SharePoint URL user should connect to. 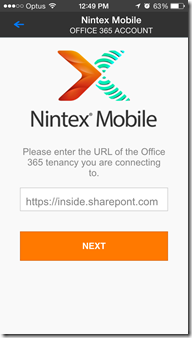 If you use Nintex Mobile to connect to an Office 365 tenancy, this represent the tenancy URL to which users should connect to. Please note that this value must be URL Encoded. To URL encode a URL you can use many free online tools like this one. *note that all of the fields are optional. All you need to do is create a hyperlink in an email, web page, document etc. and point it to this URL. Hope this has been useful for you and don’t forget to provide your feedback for Nintex on https://community.nintex.com. Once in a while you may end up having orphan Nintex Workflow tasks in your environment. Normally you wont end up in this situation in you production environment as this is normally as result of playing with the workflow or the list. Navigate to your SharePoint site. Choose to edit the page. Press Add button to add the web part to your page. Once the web part is added press Save button. The ones which have Remove task link button are orphan tasks and you can delete them by clicking on the link. if you don’t see them in the first page, make sure you navigate to all pages and delete them all. Unfortunately the this moment there is no way to delete them all in one go and you need to do this one by one by one. Go back to your Nintex Mobile, Delete Local Storage and you should not see the tasks anymore. Hope this post saves you some headache. So first things first. You are asking if this is a marketing email? answer is yes. I am expanding my team and I am writing this post to convince smart developers like yourself to come and work with us at Nintex. It’s me writing this and these are my own view points. No one from the company has asked me to write this (in fact no one knows that I am writing this. not even HR). If you are reading this post I am assuming you are already familiar with work culture in good IT companies and their benefits like flexible hours, hack days, free drinks, great work place etc. So I won’t bore you with them. So my team and I work on mobile applications. We create enterprise mobile apps in real sense which helps companies be much more productive. Now creating mobile apps is cool itself, but boy tell me about creating high quality enterprise mobile apps. Not many of us are fortunate enough to get to work on enterprise mobile apps which pushes mobile applications to their boundaries. It’s cool. It’s like the hottest thing now. 2- How do we work? We are open to any practical development technologies be it native, xamarin or hybrid. You get to work with the latest and hottest technologies. At the moment we create our apps using native languages Objectve-C, Java and C#. All of us code in all three languages on all three platforms. It’s as sweet as it gets for developers. You get a taste of everything xcode, eclipse, visual studio you name it. But the coolest thing is how we design our apps architecture across the platforms. we have literally managed to adapt all patterns we use in backend technologies to all platforms and keep them alike. Inversion of Control, Dependency Injection, Repository pattern you name them and we have them on all platforms. Heck, we have even managed to replicate C#’s Async-Await in Objective-C how cool is that? 3- What about the team? Absolutely. Challenge is what keeps on going and not getting board. Everyday we have some nice technical challenge to attend. It keeps the blood flow constantly. 5- How is the company? I will tell you this from developer to developer, I believe that it says it all; There is absolutely no bureaucracy. 6- What is the most important thing you achieve? Well there is a reason Melbourne has been the most livable city in the world in the last few years :)Great people, great life style great city. I am an expat here but I wouldn’t leave this place and neither will my wife both of us love it here. I tried to keep it as short as possible and hopefully this will give you some good reasons to come and work with us. So if you fancy working with us in the down under, drop me a line and we’ll setup some interviews. My twitter address is: https://twitter.com/vahidtaslimi and my email address is: vahid@taslimi.me.